From initial design and budgeting to final installation and testing, TA can provide management and supervision for all phases of a project’s technical design and construction. As an independent consulting firm, TA does not stock or sell product or earn commission on the products we recommend. We have no bias towards a particular product line, except to make sure that it fits our client’s needs. This assures our clients that they receive the most cost-effective system! The acoustics within a facility include 3 main components: room acoustics, sound isolation, and mechanical noise and vibration control. Harsh acoustical environments can drive guests away. Room Acoustics: Excess reverberation can render paging and background music systems unintelligible. The quality of sound within a facility is directly affected by the physical shape of interior spaces combined with wall and ceiling finish materials. By working with the design team we can identify surfaces and finish materials that will promote natural acoustics without impacting the project budget. Sound Isolation: Careful thought needs to be given to how much noise (if any) is acceptable from adjacent zones, and which areas need to be insulated from other zones. Our team evaluates the acoustical properties of vulnerable areas like exterior and interior walls, doors, ceilings, and floors. This lets us recommend the most cost effective construction methods and materials for improving the overall sound isolation. Mechanical Noise and Vibration Control: Mechanical and plumbing systems which are not properly isolated from the guest will distract them and interfere with their shopping experience. TA can review designs for planned or existing facilities and recommend cost-effective methods for controlling noise from all types of mechanical or electrical equipment. Most systems are more complex than just a series of monitors or projectors plugged into a VCR. There are many distribution, timing, and control issues to address, especially if you want the visual images to be in “sync” with each other or with specific events. TA can assist you in selecting the technology that best meets your needs, determining the distribution system requirements, and incorporating separate video stations, video walls, projection systems, or other large format displays. Great sound systems are the backbone for any retail environment, though it usually takes more than one system or zone to cover any facility. Different zones need separate dedicated systems: children’s, young adult, gift wrap, customer service – all require different marketing messages/atmospheres. Issues include presets, feedback suppression, automatic volume control, and pre-recorded messages. TA helps you get the most out of your audio since we not only understand the impact of equipment selection and location, but also account for these systems interacting with the facility’s acoustic properties. The primary goal of a control system design is to incorporate all facets of a system’s operations into one user-friendly environment. All of TA’s audio, video, and show control system designs are developed with the intention that the system will be operated by non-technical personnel, thus designs are straightforward and intuitive. After the audiovisual system has been installed, TA can act as the audiovisual technical expert for you. TA will conduct onsite tests that verify the performance of your audiovisual systems, and verify the contractor’s compliance with contract documents. We will make adjustments to the systems to optimize performance. TA will generate a “punchlist” of items that will clearly define shortcomings in the system that, when corrected, will give you the best performance out of your system. Services include: Audio system testing and tuning, DSP program adjustments, Control system verification, Video display testing and tuning. The lights begin to dim, the audience takes their seats, voices lower, and all you can hear is the quiet rustle of theatre programs and an occasional cough as the audience waits in anticipation for the curtain to rise on the latest, long-awaited Broadway play. The excitement builds as the curtain slowly parts, revealing an elaborately decorated set and beautifully costumed actors. The orchestra begins the prelude and the play begins. But wait. The actors can barely be heard! The orchestra is drowning out their words! All of a sudden the audience hears the air conditioning units coming on, a ventilation grille is rattling, and you can hear the people in the control room talking! The audience is getting restless and some patrons start to leave before the first act is even completed! How could this disaster have been avoided? 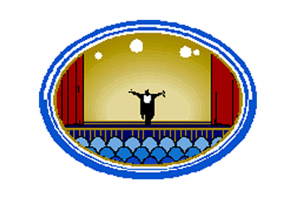 “The basic shape of the theatre can have an impact on the acoustics. Some shapes work and some don’t. You may not be able to change the shape of an existing building, such as a historic restoration, or one that was designed without considering the acoustical impact of the dimensions, but it is still possible to better the conditions while working within these parameters. 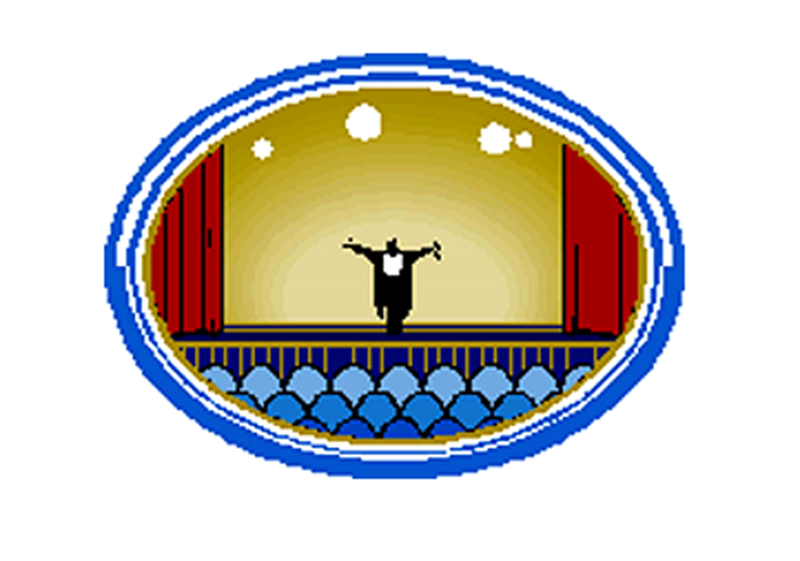 There are several acoustical goals when planning for multi-purpose theatres. First, you must provide enough reverberation for the blending of musical performances while still maintaining high levels of speech intelligibility for drama and other spoken events. One option to achieve this is through the use of diffusing panels. Diffusion is extremely important in rooms used for musical performances. When good diffusion has been achieved, listeners have the sensation of being enveloped in sound. The second acoustical goal is the control of noise from the building’s mechanical system (HVAC fan noise, for example) whose noise should be prevented from impacting the theatre. A theatre has to be protected from mechanical noise so the theatre is ideally located as far away from the mechanical unit as possible. The remainder of the duct work should be treated with acoustical lining to further reduce the fan noise. The third goal for a theatre is to keep the noise out. Through the use of thick wall construction and acoustically gasketed doors and vestibules, the exterior noise should be kept to a minimum. All penetrations into the theatre shell should be acoustically sealed to minimize air leakage, therefore minimizing sound leakage. The theatre shell should have partitions designed to a Sound Transmission Class (STC) of 55 to 65, depending on the seating size of the theatre. Doors into the theatre should range from STC 40 to 55 depending on location and adjacent uses (corridor, mechanical, or outside). The STC is a single rating designed to give an estimate of sound insulation properties of a partition. Numerically, STC represents the number of decibels of speech sound reduction from one side of the partition to the other. Speech intelligibility is greatly affected by reverberation. The optimum reverberation time for speech auditoriums vary greatly from churches to opera houses to studios. The lower reverberation times for speech auditoriums demonstrate the influences of reverberation on speech intelligibility. The rate at which the reverberant sound dies away is measured by the reverberation time, defined as the time required for the reverberant sound to diminish by 60 dB. The reverberation time can be calculated approximately from the formula, T = 0.05 V/A, where V is the room volume, and A is the absorption in sabins, a sabin being the absorption of a square foot of perfect absorber. Certain values of reverberation time have been found acceptable for various applications: for speech the middle-frequency reverberation time should be about one second or less; for solo instruments and chamber music, 1.0 to 1.5 sec; for symphonic music, 1.5 to 2.0 sec; for church music, 2.0 to 2.5 sec. Generally, longer times are accepted in larger halls and with larger musical ensembles. The time should be nearly constant with frequency, although for music a slight rise at low frequencies is desirable. What happens to a sound wave when it reaches a surface depends upon the absorption of the surface. Surfaces such as concrete or masonry that are impermeable have absorption coefficients less than 0.05 and are regarded as almost perfect reflectors. Other surfaces such as thin plywood and plasterboard may be reflective at middle and high frequencies, but may have absorption rates as high as 0.50, due to panel resonances, at low frequencies. On the other hand, a thin porous material mounted against a hard backing will be mainly reflective at low frequencies, but will increase in absorption efficiency with increasing frequency. Acoustical plaster, carpet and wood are typical examples of this type of surface. Draperies also tend to absorb mostly at high frequencies, being practically transparent at low frequencies. To achieve a constant reverberation time, it usually is necessary to adjust particularly the low and middle-frequency absorption. An efficient absorbing system in this range often consists of a slotted or perforated screen over a backspace containing porous material. The backspace, the perforated surface and the absorptive material constitute a resonant system that can be tuned to whatever frequency range is desired. Some commercial acoustical materials combine two of the above features. Generally, the audience provides most of the absorption, amounting to about 5 sabins per person and nearly constant over the important frequency range. In an acoustical environment it is unfortunate that we have to depend so much on audience size. Well-upholstered seats and carpet, both partially masked when an audience is present, help to level out the variation with audience. One of our clients once stated: “A person needs to be at a location to facilitate the work process, not attend a meeting.” We have all heard about a business executive who took a three-day trip overseas to attend a one-hour briefing. Video Conferencing might have been a solution for these issues. Video Conferences cannot replace the need for a face to face meeting to “close the sale” or for the first meeting with a new client. They are a replacement for flying everybody in for a team meeting to review the status of the project. What was once a “specialized” form of communication that was extremely expensive to implement and costly to maintain is now widely applicable and cost effective even for modest small and medium sized businesses. In fact, video conference communication has become a core component of almost all of the Fortune 1000 companies, and is a critical component for any company that intends to compete cost effectively in the modern marketplace. Though many people have felt that this technology has too many problems – poor video quality, unintelligible audio with disconcerting echo, limited ability to embrace modern PC based software tools, indecipherable and confusing controls, and connectivity that only seemed to work about 50% of the time – we have all learned that this does not have to be the case. Who will use the system? Engineers for collaborative design work? Marketing for coordination of sales efforts? Human Resources for initial interviews or to present changes to the benefits package? Management for board or committee meetings? Others? What will the users present to the Far End? (Far end is the people you are conferencing with at the other end of the network/phone system – sometimes called “them.” The near end is your room, sometimes called “us”). TA provided this traditional design for a Pharmaceutical company. 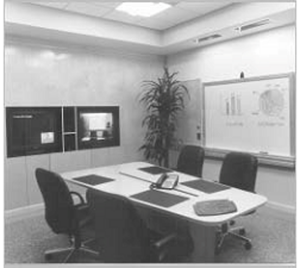 The video conference facility was used by their research teams in conjunction with their offices in Europe and Asia. Note the microphone over the white board, where much of their interactive work was done. Is, or will, the room be shadow free for all of the lighting sources in the room? It is important that there be no shadows so the camera can pick up all of the detail – this is especially important for the participants’ faces. You do not want the participants to appear over-tired with shadows under their eyes or worse, to have their faces completely in shadow so that the other end cannot read their facial expressions. Are the lights all the same type; fluorescent, incandescent? For any video signal we want all of the cameras to have the same quality and type of light. Mixing lighting types “confuses” the camera. Incandescent lights have more red light, fluorescent lights have more blue and green. Imagine the camera’s confusion as it pans from one face to the next – whose white shirt is really white? Are there outside windows? Not only is a window another source and type of light, but any movement of trees or bushes in the wind outside the window will cause shadows within the room. These moving shadows will be “seen” as a moving light source by the Video Conference system. This makes the system work harder, thus reducing the quality of the image at the far end. Has the room been acoustically treated? Is there fan noise, echoes in the room or noise from the hallway or adjacent rooms? What is the room layout and what will the main camera location see? 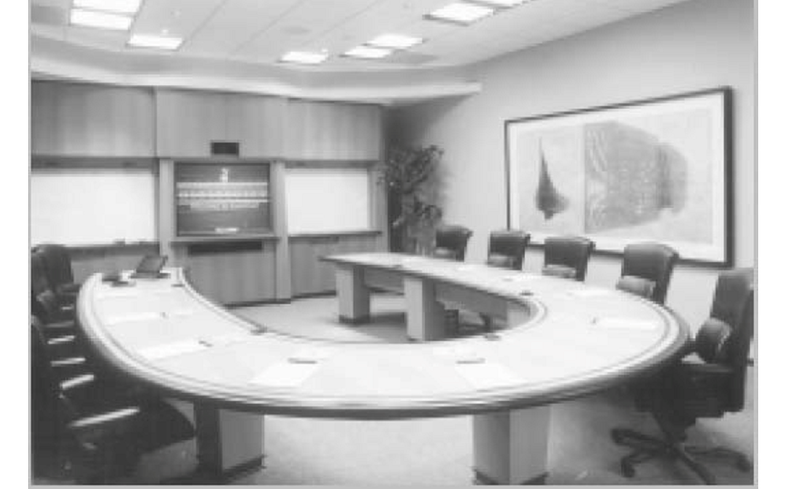 TA responded to the needs of this software design firm’s management and sales teams by using a horseshoe shaped table which allows everyone to be seen during a video conference as well as allowing the presenter to directly interact with the participants during a sales meeting. How many cameras are needed to cover the participants and any white boards? Are VCRs or still video (an electron Microscope for example) required? Are document cameras for displaying 3D objects such as packaging samples for circuit boards required? Will the meetings be internal to the company only? If so, then we can look at sharing a space on the existing computer network via the H.323 videoconferencing CODEC or as it is sometimes called, IP based conferencing. If the meetings are external to the company, then we look at H.320 or ISDN/Fractional T-1 conferencing. 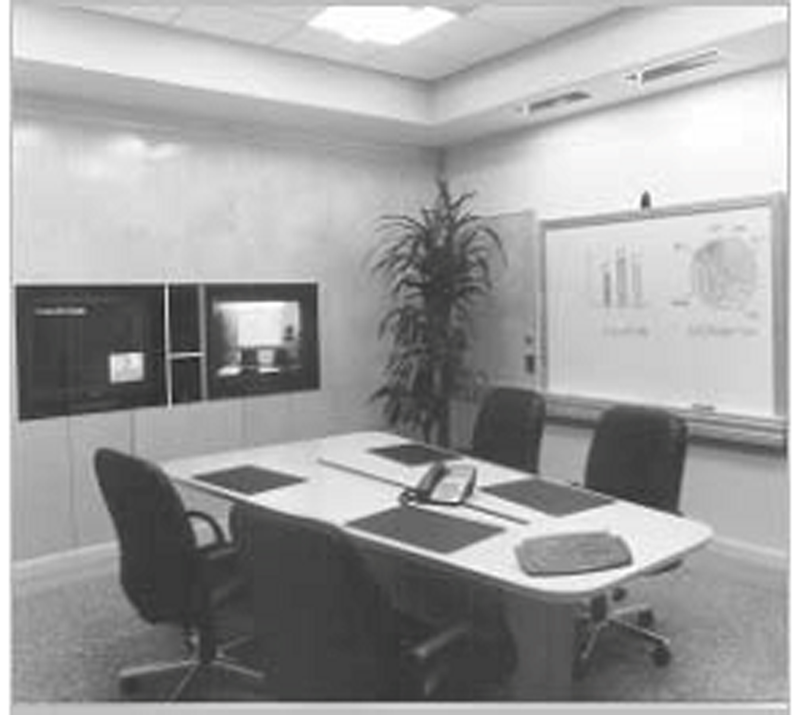 Video Conference network design is as important to the design of the system as the room design. Finally, how to use the system is important. Let’s face it, these systems intimidate people. 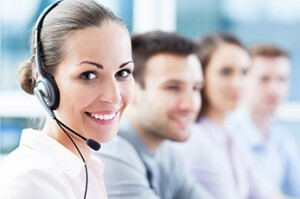 There is typically a single staff person who knows how to place a call. A well designed control system can make the system easier to use. A good Video Conference facility is only as good as all of the parts. Desktop or set-top systems designed for one person in a small window on a computer monitor cannot be scaled for multiple people in a conference room. Video Conference has been defined as “a bad form of, or poor quality, TV.” We now understand that this is not a problem with the technology but, rather, a problem with how we implement and how we use the technology. With careful planning, the Video Conference system can be a form of profit center for your firm; it can speed up project delivery times and it can help unite remote offices. You know those dusty boxes of photographs you’ve been meaning to put into an album? Or the shelf full of videotapes of the kids growing up? The glass-plate slides your dad took on vacation? Or even the 8mm film reels of you taking your first steps? Well, they’re not going to be around forever! Those memories of yours are all in analog format, which gives them a shelf life of about ten to thirty years – not long enough to hand down through the family over the generations. First, what are the differences between analog and digital and why should you transfer your tapes and photographs? In analog recording, the signal recorded on the audio or video tape is a representation of the signal originally heard or seen by the microphone or video camera. It sends signals in a wave of reflection similar or “analogous” to the original signal. The one advantage of analog recording for archival purposes is that the deterioration over time is gradual and discernible, allowing for transcription before reaching a point where it has degraded to an unusable level. Drawbacks? The quality of the duplicate will not be as high as the original because every time it is copied the original information signal is copied along with any tape or electronic noise. Also, the medium of tape itself is not particularly stable because of its layers of magnetic particles, binders, and backings. Photos on paper are acidic and will deteriorate as well. In digital recording, the audio or video source signal is “digitized” – the signal is sampled at particular points along the wave and converted to a number that reflects the intensity of the signal. This is done by using a binary numbering system. On playback, the numbers are read and used to reconstruct the original signal. A digitally recorded tape will show little, if any, loss of quality when copied. The binary numbers (ones and zeroes) are read from and written to the tape. These numbers are distinguished from the background noise, whereas the analog recorder cannot tell the difference between background noise and the recorded signal, thus recording both. Digital media can be viewed in a variety of ways: computer, movie screen, or by printing onto paper. It also allows for more and better manipulation of the image – change the size, add another image to the photo, improve color quality, etc. Even those faded Ektochrome slides from 50 years ago can have the colors adjusted and restored! But this manipulation also creates a drawback – the image can be manipulated or altered without recognition – not a good thing when it comes to government documents or when offered as evidence in court. Use and store magnetic tape reels and cassettes in clean environment. Clean your VCR, store tapes in dust free containers, rewind your tapes, keep photos in a covered box or album. Avoid fingerprints, food, or smoke, near the media. Keep tapes and photos out of strong light. Avoid drastic changes in temperature and humidity. Use buffered and/or acid-free storage whenever possible. Lower light or use ambient light. Provide air circulation around the exposed medium. Your family memories are not the only ones that need preserving. Museums, libraries and cultural organizations are rushing to record images of antique photos, maps, paintings, and other important historical media onto digital format. These institutions have always tried to find better ways of preserving artifacts by monitoring humidity and temperature, storing objects in archivally correct containers, and generally creating a safe environment to add longevity. Obviously, we cannot transfer all of these items to digital format. But we can make digital copies in film or photo or sound to monitor their conditions. Digital preservation is important to an archivist because it reduces the amount of time an object has to be handled, alleviating the “wear and tear” factor. But the most wonderful reason to put as many objects and artifacts into digital format is so that they can be made available for viewing by the general public in museums, libraries, schools, and other institutions. These “digital surrogates” are great teaching tools, bringing the history and beauty of the objects to those who might not otherwise have a chance to see them. The Library of Congress is making efforts to create a national digital library, including archival collections, texts, images, sound files, full-motion video, and other document types. The Museum of Television & Radio in Los Angeles has sound and tape archives to be restored and preserved. The National Digital Library Program (NDLP) is well on its way to its goal with thousands of books and works on paper already in digital format. Digital images should compliment, rather than replace other formats. Quality and clarity of the image should be of the highest priority when creating a digital image for archival usage, while optimizing the potential for longevity. Different media types require different techniques for digital conversion. An illustrated manuscript or old map will require an overhead file format. This same resolution can be used for three-dimensional objects to be represented in two dimensions. Large old photos to be reproduced require 24-bit, 4096 x 6144* resolution and TIFF archive file format. A drum scanner can be used, depending on the size of the photograph. Transparencies are scanned at 600dpi so that they can be enlarged as a print without losing quality. A document 10-inches across scanned at 600dpi requires 6000 pixels. A 5-inch tintype scanned at 300dpi requires 1500 pixels. Legibility and clarity of the digital image results from a combination of resolution and a bit of depth. Resolution involves the number of pixels or dots per inch (dpi) – the more pixels, then the more detail. And the higher the resolution the larger the file size. Digital file storage can require large amounts of physical storage. The use of compression can reduce this storage space. Storage types include: JPEG Screen Presentation Format, PDF Portable Digital rescue efforts continue. Realizing that digitizing artifacts won’t actually preserve them physically, it will still make available to many people the hidden treasures held in museum storage vaults and rarely seen by the general public. And also realizing that the technological obsolescence of the digital format is probably just around the corner, we will continue to prepare for different ways to preserve those precious memories and our cultural history. Maxwell Smart’s Cone of Silence was a nice idea. Wouldn’t it be great to be able to use such a device in today’s busy and energetic society? Well, for some types of noise it has been possible for a person to have their own personal Cone of Silence. Active noise control is the solution. This is a technology that was first introduced and commercially developed in the late 1970s for manufacturing and plant noise. Now individuals can use this technology for themselves. We have had a set of noise cancelling headphones in our office for the past year and they are primarily used for airplane flights. We have also seen individuals use the headphones in open office areas at dot.com companies. Just like the concept of anti-matter mentioned by engineer Scotty on the television series “Star Trek,” the concept is as simple as its name. We make noise that has an equal and opposite phase (polarity) as the tone we want to cancel. Our headphones work on this very principle. There is a tiny microphone on the outside of the headset. It picks up the noise that is in the environment around us and then, looking at the signal, turns it 180 degrees out of phase and mixes this signal into what we are listening to on the headphone. The results are like night and day. The drone of noise, whether it is airplane or office noise, is filtered out. The problem is that the system does not filter out impulse noise such as voices or chimes. In the 1970s anti-noise or active silencers were developed for mechanical duct work and flues. This type of product typically had a low frequency component that could be heard. Traditional noise control concepts such as duct lining or silencers were either not effective or could not stand up to the heat or corrosion of the duct or flue. By inserting a measurement microphone in the duct or flue, the character and level of noise could be determined. A little further down the duct a series of loudspeakers generating noise opposite to that measured by the microphones were bolted to the outside of the duct or flue. Openings cut into the surface of the duct allowed the sound produced by the loudspeakers to mix with the noise from the flue. When this happened, the levels cancelled each other out and the noise was significantly reduced. To make sure that the system was working, the noise from the furnace or fan was checked with a microphone further down the duct, beyond the loudspeakers, which sensed the sound levels and made tiny correction to the anti-noise being produced by the loudspeakers.The second microphone provided controlled feedback allowing the system to make subtle changes over time. From a control system description, when we have feedback we have what is called a closed loop control system. This means that we can track and follow changes. This is what allows our headphones to work. The relationship between the headphone, the microphone and the ear all remain the same. This means that as the noise environment slowly changes, the headphone can keep up with the noise. Military, commercial, and now private pilots use this technology to allow radio communications to be more easily heard and understood. But if it works so well for ducts, flues, and headphones, why don’t we see more of this technology? Well, it goes back to that closed loop. The microphone, noise source, loudspeaker and listener all need to remain in the same fixed physical relationship. If one of these components is moving we cannot create reliable anti-noise. The State of California Department of Transportation tried to work with this a few years ago in Northern California. They placed microphones and loudspeakers along a portion of a highway north of San Francisco. The goal was to see if by using active noise control, they could achieve the same results as a noise wall would. They could not. They did not have enough loudspeakers, microphones and computer processing to track all of these moving auto sources as well as moving listeners. The test did not work. Based on what is needed to track each source and listener, it will be a very long time before we can use active noise control for traffic noise. We are now seeing active noise control being introduced in new products. By now we have all heard how loud the new digital projection systems are. The fans that are needed to control the heat build-up are loud. Panasonic has developed a projector that can have active noise control added to it. People who have heard it, or should we say, have not heard it, say that you hardly know that the projector is on. This would be a plus for any boardroom. The downside is that the projector is expensive and the active noise control package adds about $20,000 to the projector. Active noise control works here because the noise source (the fan), the microphone, and the loudspeaker are always in the same relationship, just like the duct or the flue. Readily compatible with a wide variety of video sources. Low fan noise, easy set-up. It is our guess that this is the way things will be addressed in the future. As computer processing speeds up, microphones and loudspeakers will get better and smaller. Active noise control will be coming to other locations near you. High Definition Television (HDTV) promises bigger and better images and great audio. But what exactly is HDTV and how will it affect our television viewing? Consumers are experiencing a confusing mess of conflicting standards, limited programming, few available channels and outrageously expensive equipment. However, with the ratification of the advanced Television Systems Committee (ATSC) Digital Television Standard, the long promised delivery of HDTV can finally begin. The main selling point for HDTV is the high resolution image. An HDTV can more than double the lines of information transmitted to your screen. In terms of visual impact, this is a change similar to the one from VGA monitors (640 x 480) to XGA graphics monitors (1280 x 1024). The picture will also be wider. The width-to-height ratio for HDTV is 1.78:1 (commonly referred to as 16:9, see box below), compared to today’s TV broadcasts at 1.33:1 (or 4:3). For an image 27” high, your screen needs to be 48 inches wide (versus 36” with a standard TV), so factor width into your design! This change in aspect ratio more closely matches motion pictures, commonly shot in a 1.85:1 format. HDTV will also carry great audio. The Dolby Digital sound program information that is now available on some broadcasts will always be provided. HDTV broadcasts can be encoded with six separate audio tracks. So each track can be sent to a different loudspeaker. This allows detailed and realistic surround sound. The ATSC standard also provides for a data channel that will allow the receiver to display related information such as scrolling text or computer software downloads. The current television standard in North America, Japan and various nations around the world is 525 horizontal lines of information refreshed almost 60 times per second. This television system is called the NTSC (National Television Systems Committee). In Europe, most of Asia, Africa, and South America, a system known as PAL (Phase Alternating Line) is used. PAL is 625 lines of information updated 50 times per second. By mandate of the Federal Communications Commission (FCC), each receiver sold to the American public today must be able to receive the NTSC television signal, must include a UHF tuner and have closed captioning. The FCC has made the addition of MTS (multi-television sound) stereo audio voluntary, but has provided rules and regulations so that both signal providers and set makers know exactly what to build. Why change television at all? Basically, we’re dealing with limited real estate. Digital broadcasts take up a fraction of the airwave space that analog broadcasts take up. The system that we are currently using was developed in the mid- 1930s and has proved to be a durable means of transmitting information to the home for over 70 years. Since then, there have been significant advances (such as color, cable, satellites, etc. ), but they have all been developed out of the original technology. At some point, we have to shift paradigms. Unfortunately, updating a broadcast facility to change formats is not as easy as changing operating systems on a computer or getting cable TV brought into your home. When do I have to buy a new TV? Nearly all of the Top 30 markets (see sidebar) have at least one station broadcasting in digital and many of the other metropolitan markets are well ahead of schedule with one or more networks broadcasting in digital. Broadcasters outside of the top 30 markets are not mandated to begin any digital TV broadcasting until 2002 and no one has said how much digital broadcasting they will have to do at that point. On May 17, 2000 the National Association of Broadcasters (NAB) announced that the number of television stations broadcasting in digital jumped to 134, capable of reaching 63% of all U.S. television households. Conventional televisions and analog broadcasting we’ll believe it when we see it. I need a new television now. Should I go for an HDTV? Good question! We believe the set you buy today will serve you well for many years and that the HDTV experience will take a long time to develop in terms of affordability and programming choices. The TV signals as we know them will be around at least until 2006 to ensure a smooth transition to HDTV. This means that the set you buy today will have signals to show for at least 6 years! Some manufacturers have announced plans to introduce add-on boxes that will allow conventional TV sets to receive and show digital broadcasts. Of course, with addon boxes you won’t see broadcasts in a wide screen format and you may not see all of the resolution being broadcast, but you will be able to watch your set beyond 2006 and you can add the converter box at any time. Even if you live in one of the top markets where digital broadcasts are currently, or will soon be, available, the first HDTV sets on market are priced from $3,000 to $14,000, depending on size and quality! And even if you buy an HDTV set, you still need programs to watch on it. Much like the early owners of color TV, early adopters of HDTV will have very limited high definition programming to watch, although they will still be able to view regular programming. It will take a couple of years for the studios and broadcasters to convert their programming to an entirely HD lineup. What about Cable and Satellite Broadcasts? Approximately 65% of the country receives their TV signal via cable or satellite. Presently, no HDTV sets are guaranteed to be cable compatible when the cable systems eventually offer HD programs. The present FCC HDTV regulations only govern over-the-air transmission of TV signals. Rules for cable stations have not been developed in regard to HDTV. Major cable companies have said they will oppose any FCC effort to force them to carry HDTV signals in full definition. Cable and satellite providers may choose to convert to digital signals and formats at different rates and resolution, if at all. Ultimately, this may end up being a court case with the FCC on one side and cable service providers on the other. The bottom line is that it may be a few years before HDTV technology will be affordable to the majority of the country. It will take time and lots of money for stations to convert to HDTV, much as it took time for stations to transition from black and white to color. Personal HDTV sets will be expensive for some years to come. Even after HDTV is well established, a TV set that you buy today won’t become entirely obsolete since converter boxes which will allow display of HDTV signals on an existing TV (but without the wide screen and some of the detail) will be available. So keep in mind that it may be seven to ten years before HDTV sets and programming become affordable and widely available. By that time, you’ll probably have gotten your money’s worth from the set you buy this year! Environmental Acoustics: Is It Noise Or Is It Sound? How loud is too loud? If you have ever dealt with this question, personally or professionally, you know that the answer is difficult to determine. All kinds of factors, from the time of day to personal sensitivity, influence the subjective cry “Too much noise!” In fact, the term noise is used to indicate any sound that is unwanted. And what to one person is music may be harsh and unwanted noise to another. Just ask the parent of any teenager! In this article we will unravel some of the mystery surrounding environmental acoustics. What contributes to this issue? What are the terms and concepts used to discuss it? The Building Blocks Most likely you have heard the term decibel, but perhaps LEQ, dBA, or Ldn are less familiar. Many terms have been created in an attempt to help set some guidelines for discussion of environmental sound. The first term, level, is the first one that many people think of when describing a sound. 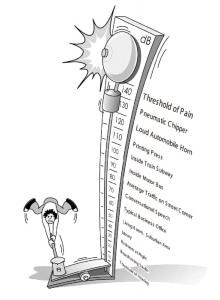 It is a measure of intensity or loudness, generally expressed as decibels (dB). 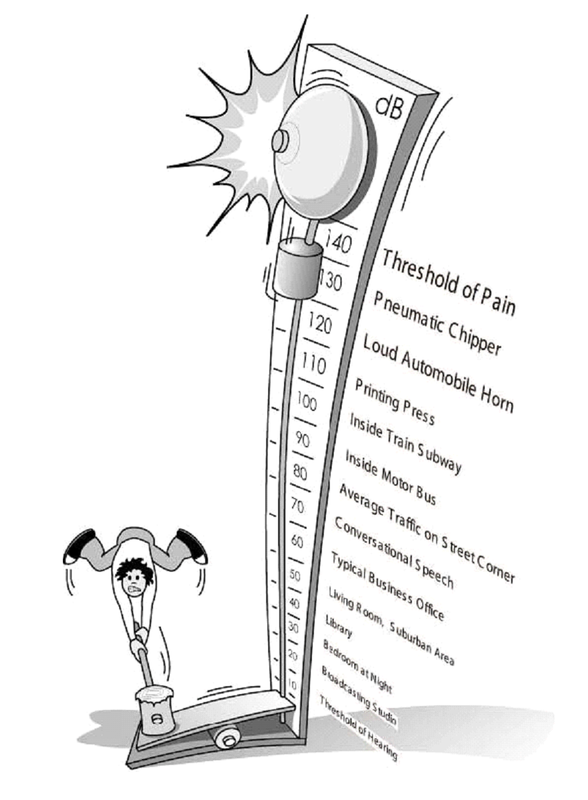 Check out the diagram at right to see a comparison of common sound levels. Another way people speak of a sound is “high and whining”, or “low and rumbly”. This refers to the pitch, or frequency. Frequency is expressed in Hertz (Hz). Because the human ear perceives extremely low and high frequency sounds as less annoying than mid frequency sounds, different weighting scales have been developed. Environmental measurements are commonly made using the “A-weighting” scale. This scale represents the subjective “noisiness” of a sound and more closely corresponds to the sensitivity of human hearing. Sound levels measured with an A-weighted scale are referenced as “dBA”. The drawing above uses A-weighted sound levels. Although the A-weighted noise level may adequately indicate the level of environmental noise at any instant in time, community noise levels vary continuously. This leads us to the third characteristic, time varying characteristics. Basically, this characteristic looks at how the sound levels change over time and how sensitive humans are to those changes. Most environmental noise includes a combination of noises from distant sources (traffic, wind in the trees, waves crashing on the beach, etc.) These create a relatively steady “background noise” in which no one source is identifiable. The amount of noise above the “background noise” will vary over time, therefore it is helpful to know the A-weighted noise level that was statistically exceeded during 10%, 50%, and 90% of a stated time period. These levels are referenced as L10, L50, and L90. A single number descriptor called the LEQ is also widely used. The LEQ is the average A-weighted noise level during a stated period of time. Adding another element into this mix is the fact that noises tolerable at 3 pm are unbearable at 11 pm. Light traffic on a nearby street may only be 70 dB, but at night, the exterior background noises are so much lower that the same amount of traffic becomes noticeable. To account for this human sensitivity to nighttime noise levels, a descriptor, Ldn (day/night average sound level), was developed. The Ldn divides the 24 hour day into the daytime hours (7am – 10pm) and nighttime hours (10pm – 7am). The nighttime noise levels are “penalized” or weighted 10 dB higher than the daytime noise levels (thus a sound that would be weighted at 40 dB during the day is given a rating of 50 dB at night. Another 24- hour average sound level, the Community Noise Equivalent Level (CNEL) is also used and includes both an evening (5 dB Penalty) and nighttime weighting (10 dB Penalty). The levels associated with environmental noise, in almost every case, produce effects only in the first two categories. Workers in industrial plants, airports, or race tracks can experience noise in the last category. The wide variation in individual thresholds of annoyance and a person’s ability to adapt to existing noise means that there is no satisfactory way to measure the subjective effects of noise, or of the corresponding reactions of annoyance and dissatisfaction. Therefore, an important way of determining a person’s subjective reaction to a new noise is to compare it to the existing environment — the so-called “ambient” noise level. In general, the more a new noise exceeds the previously existing ambient noise level, the less acceptable the new noise will be judged by those hearing it. Here are some interesting facts that help put all of this into perspective. Except in carefully controlled laboratory experiments, a change of 1 dB cannot be perceived. Outside of the laboratory, a 3 dB change is considered a just-perceivable difference. A change in level of at least 5 dB is required before any noticeable change in community response would be expected. A 10 dB change is subjectively heard as approximately a doubling in loudness, and would almost certainly cause an adverse change in community response. We hope this has helped clarify some of the issues surrounding environmental acoustics! In a previous blog post we covered the differences between projectors and monitors and looked at the advantages and disadvantages of current technology including analog verses digital technology. In this issue we will look at the features of brightness, resolution, and size. The brightness of the display is measures in ANSI lumens. It is very important that the projection system be matched to the projection environment. If the room lights will be off, then you can get by with less brightness. If the room lights are on you will need more brightness. So how bright is bright? As a rule of thumb, if the room lights will be on, 600 lumens is not bright enough and 2000 lumens is probably ok. The final consideration is Size. Projectors come in three main categories. ♦ Ultra portables, which weigh 4 to 8 pounds, provide 500 to 1000 ANSI lumens and VGA ad XVGA resolution, and cost between $2,500 and $6,000. ♦ Desktops, which weigh 10 to 20 pounds, provide 600 to 1300 ANSI lumens and VGA to SXGA resolution, and cost between $2,000 and $14,000. ♦ System integration/large venue projectors, which can weigh up to 50 pounds, provide 2,500 to 5,000 ANSI lumens and video to super high resolution, and cost between $5,000 and $100,000. Now, you know the difference between digital and analog (if not call and we’ll send you a copy of the last issue) as well as the effect of brightness, resolution, and size. So what does all of this mean? First, advances in technology will soon make it possible for every business to have their own projection display system. Second, only through a careful analysis of you company’s needs and requirements can you purchase the technology appropriate for you facility. Don’t be fooled by all of the buzzwords. And if at all possible conduct a side-by-side comparison of your top two or three choices. The old adage that you get what you pay for does not necessarily apply and you may find that a lower cost system will more than meet your needs. Purchasing the right video/computer projector can be a challenge. First you see an ad in a magazine touting the benefits of a $6000 projector. Then you see a portable computer projector at the office supply store sitting next to a slide projector. Then you hear a colleague talking about digital versus analog and Plasma versus LCD. What exactly are the differences in display technologies? What are digital mirrors? Should you even consider the old “3 tube” style ceiling projectors like the one installed in the training room? How bright of an image will you need? How does resolution affect image and cost? Does the type of information displayed (computer, video, or both) make a difference? How do you decide what technology will meet your needs? The first step is to understand current terminology. In this issue we will address the difference between projectors and monitors. In the next issue we will look at features such as resolution, brightness and size. Projectors are different from monitors. Both are display devices. However, projectors focus light from a bright lamp onto a surface to form an image. The image is then focused through a lens onto a screen. Monitors, on the other hand, do not use lamps or lenses. Instead you look directly into the display to see the image i.e., computer and television screens. Monitors are direct view devices. Projectors can be either “direct view” or “reflected view”. Direct view is the same as rear screen projection; you look directly at the source image. Reflected view is the same as front screen projection where you look at an image reflected off of the viewing surface. Direct view devices generally seem to the viewer to have better contrast and a brighter image. Reflective systems can be larger and are easier to install but have to contend with ambient room lights. If the system reflects light from a projector it also reflects light from any other light source in the room. You also have to consider analog versus digital. Analog technology has been around for over 70 years and uses electronic scan lines to “write” information to the display. 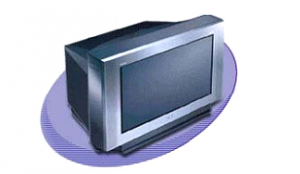 The most common of which is the Cathode Ray Tube (CRT). This is also referred to as the Raster method. Digital technology is relatively new and utilizes either small picture elements (pixels) which are turned on and off to create the image on the display or micro mirrors to direct the image either on or off the display. CRTs can either be a single color (remember the old green CRT monitors?) or have three tubes. The three tube projector (sometimes referred to as a “barco” or “beamer”) is an analog projection system. The three lenses concentrate and direct the image produced by the tubes inside the unit. The CRT then makes an image by scanning an electronic beam or line back and forth and up and down across the image tube. A CRT tube is the same type of system that makes the image on your television, but when used for projectors they are smaller, brighter, and are broken down into the primary lighting colors of Red, Green and Blue. Advantages of CRT systems are that they can update the image quickly for fast moving video and that thin lines for computer aided design are more easily reproduced. This makes CRT great for applications that require very high resolution display or that need to display different types of sources (such as video, VGA, XGA, Mac, and workstation graphics) in rooms that have good light control and do not require a very bright image. Digital projection systems are much brighter and easier to set up then CRT systems. The drawback is that they have a limited resolution and, in many cases, have problems displaying video. Digital displays make their image by turning on and off elements in the projection display. An easy way to understand this is to imagine a slide in a slide projector. Instead of a photographic image, a clear projection device opens and closes little “windows” on the surface of the slide. This allows light to shine through part of the slide part of the time and blocks it at other times. In principal, this is what Digital Projectors do. The biggest drawback is resolution. How close together are the “windows” on that slide? How big are the windows? How fast do they open and close? As technology improves, the area between “windows” is getting smaller and more “windows” can fit on the surface of the slide. This provides a higher resolution image. The speed at which the “windows” open and close also has a direct affect on the projector’s ability to handle video images. Another issue to consider is how well it handles color. In the analog projector, we said that there were three tubes that actively made up the image; red, green, and blue. In the digital projection system, we also use the same three colors, however a prism is used to split the colors up. So instead of having one slide projector with a single slide with lots of little windows, we have three slide projectors with identical slides with lots of little windows. One slide lets red light by, the next slide lets blue light by, and the last slide lets green light by. This projection process is really the CliffNotes™ version of a digital projector projection system. One example of digital projection is a Liquid Crystal Display (LCD). LCD systems are very useful for small portable projection systems. The draw back is that we can only shine so much light though the glass slide before the light creates heat damage. While the amount of light displayed is much greater than that of an analog CRT system it does not have the resolution or the quality needed for video. Another example is Digital Light Processing (DLP) which uses a technology developed by Texas Instruments (TI), called Digital Micro-Mirror Devices or DMD. This system uses thousands and thousands of mirrors, with many mirrors for each of the pixels. Projectors with the DMD engine, as it is called, allow a person to sit closer to the image without seeing the artifices or the shadows caused by the window frames. Also, by using the tiny mirrors, the DMD engine can direct the light in a number of different directions. When a mirror is told to “activate”, it reflects light out of the lens, when it is told to “go black” it reflects light away from the lens towards a heat sink, which is cooled by the projector’s fan. The main advantage of this over other systems is that this “excess” light does not pass though the projection device. If light does not pass though, then heat buildup is minimized. A third option is Plasma Display Panels (PDP). The advantage of plasma displays is that they are only 4 to 8 inches thick. Also, advances in technology now allow for larger flat panel displays. There are two current drawbacks to large flat panel displays. The first is the price which is currently around $9000. Dollar for dollar flat panels are still more expensive than a monitor of the same size. The second drawback is the resolution. Just like its counterpart, the smaller flat panel computer display, plasma display devices use a pixel based grid system to display images. This technology works well for computer displays but does not work as well when used for video display because the resolution is currently limited to 852 pixels wide by 480 pixels high. Since this is the same number of pixels for most 15 inch monitors, but displayed on a 42 inch device, each “dot” is bigger and much more visible. If you are far enough away from the flat panel, you will not notice the display process. However, if you use the flat panel for a computer monitor (and sit relatively close) your monitor will only have 1/4 as may dots per-inch as does your typical .25 mm dot pitch monitor. Now you know the differences between current projector and monitor technology. The quality of sound within a room is typically referred to as acoustics. Good acoustics is very dependent upon the type of space and the sort of activities which take place there. Large atriums and lobbies are expected to be lively and full of sound. Theatres, on the other hand, need to be quiet so we can hear the person on stage reciting their lines. Good acoustics centers around three very different issues. The first is Sound Isolation. Whether a room is large or small, noise and sounds from the adjacent spaces need to be kept out. How often have you been to a movie theater where you could occasionally hear the soundtrack from the neighboring theater? When this occurs, it’s because the partition assembly between the rooms does not provide enough sound isolation (or noise reduction) to adequately block the transfer of sound. The comment “it was so quiet, I could hear a pin drop” actually describes the background noise levels within the room. This means that sounds generated by the building’s mechanical systems are quiet enough to allow you to hear a whisper or a pin drop. If the operating systems were louder, the sound made by the pin drop (or possibly by an actor on stage) would be overpowered by the background noise within the room. This second item, commonly known as Mechanical Noise and Vibration Control, becomes more important with each new machine added to a building, whether it’s an office copier, an air conditioner, or a movie theater projector. More machines mean more noise. The third factor to consider is Room Acoustics. A main component of this is reverberation time. As a technical definition, reverberation time is the length of time it takes sound to decay 60 decibels. For a more tangible example just think about a bare room – no furniture or decorations on the walls, voices seem to bounce around, giving the room a very bright or lively sound quality. As we move furniture into the room, the brightness or liveliness of the room diminishes. This is because we have added absorption to the room, and by blocking or redirecting the path of the sound we have reduced the reverberation time. Shorter reverberation times typically allow for better speech intelligibility, while longer reverberation times have the opposite effect. However, rooms with longer reverberation times tend to be considered better for music because it allows sounds to blend together, to fuse, to mix. This enhances the musical experience and creates the sense of ensemble that we hear within a concert hall. But this same blending reduces speech intelligibility by mixing consonants with vowels. Exactly what is the difference between reverberation and echoes? Technically speaking, an echo is a discreet reflection heard bouncing off from a wall surface. Reverberation is basically a series of non-discreet echoes that have all been blended or fused together as the sound decays. Rooms that have dimensions of greater than 40 feet in any one direction should be reviewed for echoes. Are echoes bad? Not necessarily. There are very few rooms that you go into that will not have an echo. But for something to be heard as an echo, it requires three things: a source, a listener, and an acoustical path. When an acoustician walks into a room and claps their hands, they are listening for echoes. That hand clap acts as the initial sound source. As the sound travels away from the hand clap, it bounces off the different surfaces and returns back to the acoustician’s ears. They listen to how the sound has been affected among various acoustical paths. Echoes are perceived as reflections start to decay. Again, is that bad? Well, it’s only bad with typical use. If the room is not going to have a sound source in the location of the hand clap and a listener at the same location, then it won’t matter. The existence of an echo in that location is caused by the geometrical relationships of the space. So, what does this all mean? No matter how large or small the room may be, it is important to understand the acoustical requirements. How is the space going to be used? Is it for speech? Is it for assembly? Is it to be used as a transitional space from one area to the next? Great spaces like Union Pacific Station have hard interior finish materials which make them very reverberant. But the sense of energy as people move from one point to the next is refreshing. Although if you were to hold a lecture series in that same type of space, it would be quite difficult to hear what the presenter was saying. On the other hand, music performed in the same space would sound very full and very rich. As much as we would all like, very few of the spaces we actually get to work on are truly designed just for music. Communication, the dissemination of information, is usually more important. Can echoes and excessive reverberation be treated? Yes, by identifying the offending sources, determining the reflection points, and applying either sound absorptive material or diffusing material (something that will spread the sound path into many different directions). But again, for a space to be properly designed, you must first understand how the room will be used.